My food bible | Life's Conundrum - Eat to Live or Live to Eat? 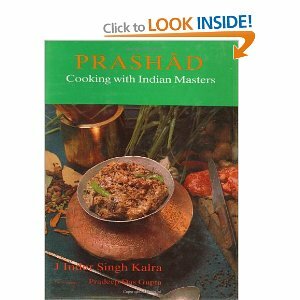 I think any budding cook/chef should get this book as it has some great Indian recipes from across the sub continent. I have pretty much exhausted most recipes from this book and trust me when I say that you can blindly pick any recipe, follow it to the last T and the outcome is going to enthrall your guests. Jiggs Kalra has taken recipes from some of the best chefs in India and recreated them for cooking in the home. He has tried each of the recipes a few times over to ensure that they are perfect. The recipes are easy to follow and most ingredients are available from UK supermarkets or Indian shops (the only exception is yellow chilli powder which we have managed to get from Delhi through a friend). I have recommended this book to friends who now swear by it. Give it a try and let me know how you get along. Posted on April 11, 2013 by Anna and Shiv	• This entry was posted in Recommendations. Bookmark the permalink.